The picture above, taken while on a mission to Brisbane, Australia, is dated July 15, 1911. 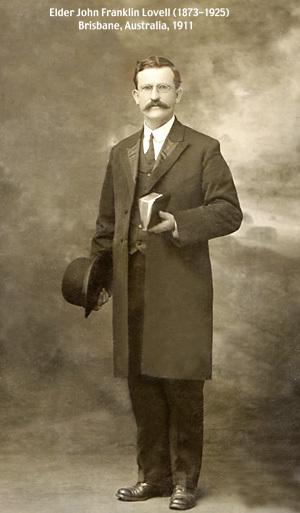 John Franklin Lovell was born 9 September 1873 in Oak City, Millard, Utah. He died 21 March 1925. In the picture above is Eliza Ann Weaverling Lovell, the first wife of John Franklin Lovell. 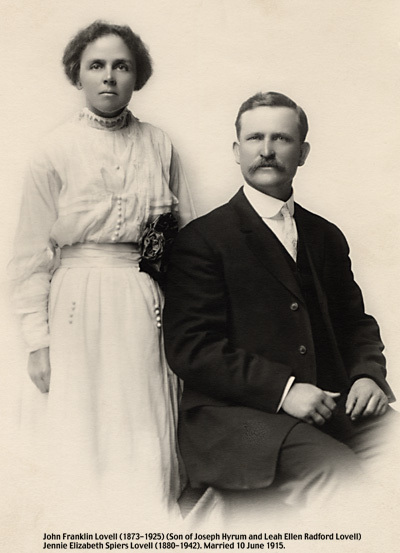 They were married 24 Nov 1898 in Logan, Cache, Utah. My record says Eliza was born 24 Nov 1878 and died 6 Sept 1913. Also in the picture are, on the left, John Hyrum Lovell, born 13 Dec 1899 and died 9 Oct 1982. 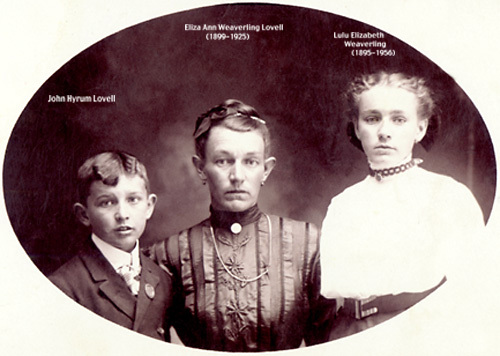 And on the right, Eliza's sister Lulu Elizabeth Weaverling, born 9 Oct 1895, Shelton, Bingham, Idaho and died 26 Jan 1956 at Idaho Falls, Bonneville, Idaho. Lulu married John William Dutson. John Franklin Lovell with his second wife Jennie Elizabeth Spiers. She was born 30 April 1880 in Brisbane, Queensland, Australia. They were married 10 June 1915. She died 9 April 1942. Three children were born to this marriage.